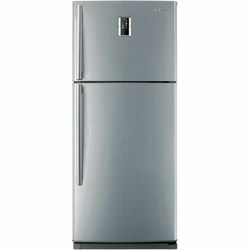 The Samsung RT59FBSL1/XTL Double Door, 487 Litre, Refrigerator s are way ahead of time in terms of technology. Its revolutionary design is looks gorgeous and is user friendly as well. The cool curtain system in the refrigerator ensures the temperature is uniform throughout the refrigerator. This premium refrigerator also has user friendly features like the external water dispenser and the tri-cool zone that lets you customise temperatures. The Cool Boosters, which release cold air into the refrigerator from the sides, combine with the Cool Curtain to provide three dimensional cooling action. Additionally, this refrigerator is equipped with Twist Ice Maker technology that can make ice cube almost instantly. The Samsung RT59FBSL1/XTL Double Door 487 Litre Refrigerator has tough glass shelves which are high on strength (can bear up to 150Kg weight) and do not break even if one drops them flat on the ground. As the glass shelves are free from heavy metals, it is safe to store food on them. This Samsung refrigerator also flaunts and easy-to-view, low-profile digital display which blends superbly with the sophisticated design. It comes fitted with the innovative LED Light System. The futuristic technology ensures that the entire refrigerator is well lit up so that you can see and access food items easily. This unique light in energy efficient and saves power too. The Samsung RT59FBSL1/XTL Double Door, 487 Litre, Refrigerator s are way ahead of time in terms of technology. Its revolutionary design is looks gorgeous and is user friendly as well. The cool curtain system in the refrigerator ensures the temperature is uniform throughout the refrigerator. This premium refrigerator also has user friendly features like the external water dispenser and the tri-cool zone that lets you customise temperatures. The Cool Boosters, which release cold air into the refrigerator from the sides, combine with the Cool Curtain to provide three dimensional cooling action. Additionally, this refrigerator is equipped with Twist Ice Maker technology that can make ice cube almost instantly. The Samsung RT59FBSL1/XTL Double Door 487 Litre Refrigerator has tough glass shelves which are high on strength (can bear up to 150Kg weight) and do not break even if one drops them flat on the ground. As the glass shelves are free from heavy metals, it is safe to store food on them. This Samsung refrigerator also flaunts and easy-to-view, low-profile digital display which blends superbly with the sophisticated design. It comes fitted with the innovative LED Light System. The futuristic technology ensures that the entire refrigerator is well lit up so that you can see and access food items easily. This unique light in energy efficient and saves power too.